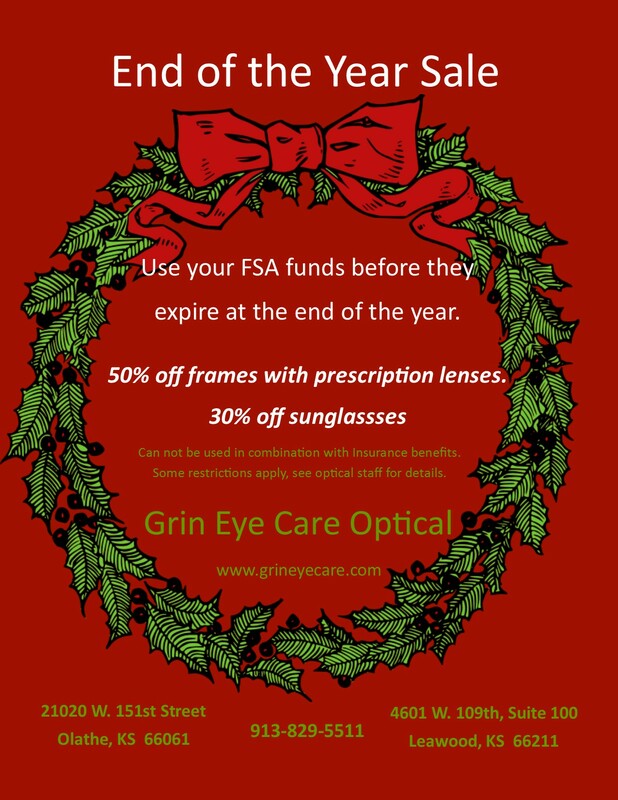 50% Off of Frames at Our End of the Year Sale! Up to 50% off frames!! To celebrate the end of a great year, we are having a sale! 50% off frames with prescription lenses and 30% off of sunglasses. * Head on over to either of our Grin Eye Care locations in Olathe and Leawood to browse through our huge selection of frames. Our optical shops carry a wide array of brands including Ray-Ban, Tiffany & Co, Dolce and Gabbana, Oakley and so much more. Whether you're looking for a gift for a loved one or even just a little treat for yourself, we have something for every style and every budget. Don't forget you can use your Health Savings or Flex Spending Accounts to purchase glasses. Our trusted doctors and friendly opticians are here to help!! Contact us to make an appointment if you need an updated prescription or simply stop by our optical to check out our frames. Don't forget we are open Saturday mornings in Olathe!